Recent release “The Lonely Christmas Tree” from Page Publishing author Kristen Hotaling is full of animated characters that are sure to keep the reader entertained. 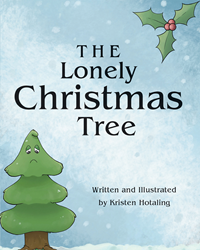 Kristen Hotaling, a bait and tackle shop owner, creative artist, devoted writer and author, has completed her first book “The Lonely Christmas Tree”: a fun and enlightening work about unexpected friendship, love, family and kindness. Published by New York City-based Page Publishing, Kristen Hotaling’s creative work is the perfect read for both children and adults. “The Lonely Christmas Tree” is a story about Bruce, a lonely Spruce Tree left in the Hotaling's Christmas tree lot on Christmas Eve. Bruce became the saddest Christmas tree around and thought that he would have to spend Christmas alone. Out of the corner of his eye, he noticed some movement, maybe one last family shopping for a tree, but no it was just some woodland animals roaming about the Christmas tree lot. Bruce did not think anything of the animals until one of the animals; Hammy the chipmunk came up to Bruce and asked what was wrong. Bruce told him that he was all alone for Christmas. Hammy then ran off, gathered the rest of his friends, and came back to let Bruce know that he would not be left alone on Christmas. This is when all the animals went on a scavenger hunt to find all the items they could to help decorate Bruce. All returned with great ideas to decorate Bruce; strings of popcorn, cookie ornaments, and left over Christmas lights and even a star. By the time they are finished decorating Bruce, he was the best-looking Christmas Tree in the entire town. Bruce was the happiest tree around and was spending it with some great friends on Christmas. Readers who wish to experience this inspirational work can purchase“The Lonely Christmas Tree” at bookstores everywhere or online at the Apple iTunes store, Amazon, Google Play or Barnes and Noble.